Sierra Steel Guitar Company has raised the bar for its pedal steel guitars. Sierra’s new vision of the pedal steel guitar is now a reality. We set out to refine and redefine the mechanical and aesthetic aspects of our steel guitars. We’re confident that our goal has been reached! We’re pleased to announce that production on our new pedal steel guitar is now underway. Check out the products page for more info. We hope you enjoy what you see! 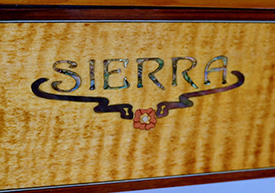 "I bought the Sierra Steel Guitar Co. so that I could continue to play Sierra Steel guitars. Now I am determined to create the best pedal steel guitar Sierra has ever made." PLEASE NOTE: This site is currently under construction. Better formatting and new pictures coming soon!